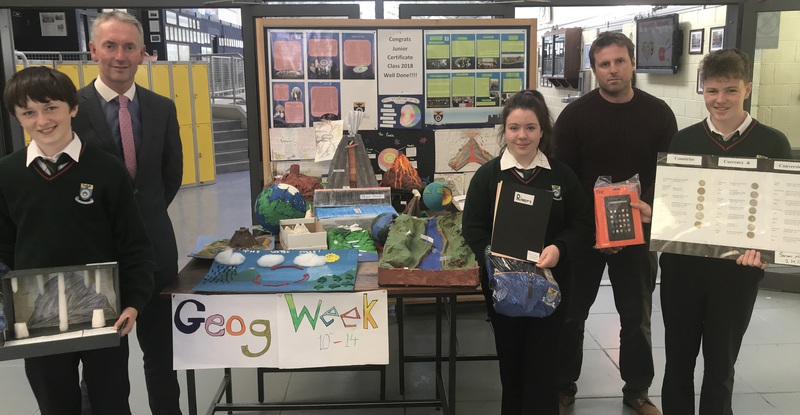 Geography Week in CCS was packed with activities and initiatives which afforded our students many opportunities to learn and use their knowledge and skills. 6th year students conducted field investigations over two (thankfully sunny!) days in Tramore. TY and 1st Year students were establishing the number of nations represented in our student body (15 & and counting). Limestone pavements and river cycles were crafted by 3D modellers in 2nd Year. These were proudly displayed in our foyer. Well done to all concerned. Mr. John Gallagher (Principal CCS), Mr Kevin Dempsey (Geography Teacher) with prize-winners Michael James Phelan, Anna O’Dwyer & Senan McMahon.